It’s strange advice coming from the author of three Indian cookbooks, but for chef and co-owner of Vancouver’s Vij’s and Rangoli restaurants Meeru Dhalwala, cooking is about much more than just recipes. “There’s no shortage of recipes out there,” she says. “For me, what there’s a shortage of is writing about the act of cooking and how it relates to being human.” Of course, humans are flawed, and while Dhalwala’s previous two cookbooks, Vij’s at Home and Vij’s: Elegant and Inspired Indian Cuisine, offered relatable glimpses into her marriage to business partner and now ex-husband Vikram Vij, her trademark frankness comes into its own in her third—Vij’s Indian: Our Stories, Spices and Cherished Recipes, published in autumn 2016. Vij’s Indian features thoughtful recipes for healthy meals, like an eggplant, kale, and cauliflower curry, snack-y sweet potato and ricotta “cookies”, and mushrooms and asparagus in creamy fenugreek and cumin curry—accompanied by anecdotes about the family’s daily existence. For the cookbook genre, so commonly filled with professionally-styled pictures and brief, impersonal blurbs, Dhalwala’s narrative is a welcome injection of realism, focusing on the supportive role food plays as we navigate life’s sometimes unglamorous, but always interesting complexities. Feeling inspired? Find three delicious recipes from the cookbook, here. 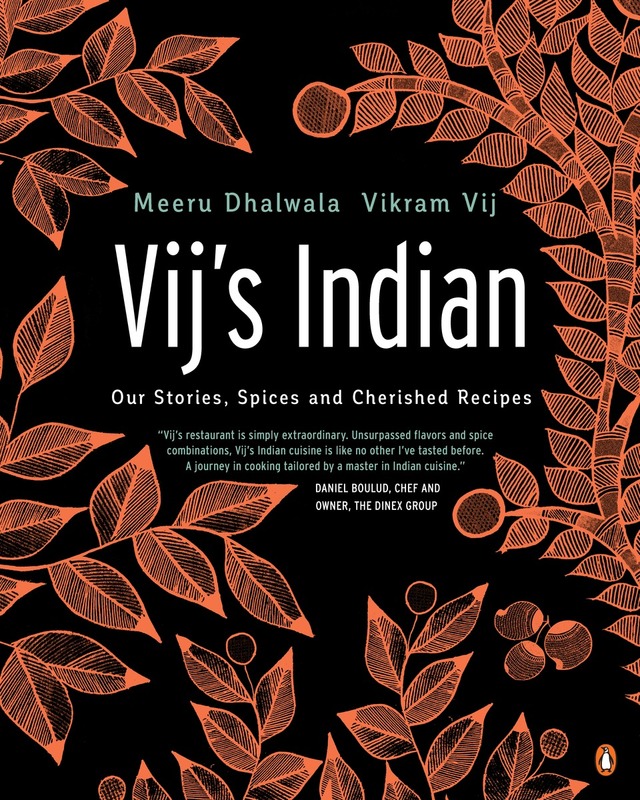 Recipes from Vij’s Indian: Our Stories, Spices and Cherished Recipes by Meeru Dhalwala and Vikram Vij. Recipes Copyright © 2016 Meeru Dhalwala and Vikram Vij. Text copyright © 2016 Meeru Dhalwala. Published by Penguin Canada, a division of Penguin Random House Canada Limited. Reproduced by arrangement with the Publisher. All rights reserved.